Heading to the spa.....ahhhhh, yea! I am so in need of some relaxation. I am heading to the spa for a few hours this afternoon and I cannot wait. Afterwards, I am going to take a steam bath and then do some shopping. All of this will occur without the kiddos so it is going to be a big treat. Yay, go me!! Dang it, I cannot wear my wedding ring now and that is really bugging me. I am not all that swollen but my ring finger is a tad bit bigger than normal because my ring can barely go over the knuckle. Ugh! I know, I know. That is a common pregnancy occurence but I have never had it happen to me. I just hate that people out in public think that I am a knocked-up unwed teenager (supposedly I look fairly young). Sheesh. Only 1 more day and I will be able to give birth in the nearest and newest hospital. They don't allow births there before 36 weeks gestation due to not having a NICU for premies. I gave birth there in December 2007 and I loved that hospital so much. I am so glad that I am going to get to go there again this time around. The place is pretty new (built in March 2007) and it offers some of the best amenites (jacuzzi tubs, wireless fetal monitoring that can even be used in the tub, plasma tvs, room service just like hotels offer and beautiful views of the Rockies). The nurses there rock too. Now we just wait until that magic day rolls around. So far I see no reason to think that baby girl is going to come out anytime soon. She seems to be happily snug in my belly. If she doesn't decide to come on her own before 39 weeks then we will have an induction on 3/17 providing that my body has progressed enough to facilitate an easy induction. Ahhhh, I can't wait to be able to sleep on my tummy and to be able to wear my own clothes again. That seems like such a dream right now, lol. I am getting so anxious which makes this process seem to drag along. Why must the last few weeks of pregnancy seem like forever? Holy cow, I am close to birthing time! I can't believe that I will be hitting the 34 week mark tomorrow. Time sure has flown. It's really weird to think that in just 2 weeks from Tuesday the baby will be considered full term. I have to make it to that mark to deliver at the nearby awesome hospital in Loveland. They don't have a NICU and any baby under 36 weeks is considered a premie which means I couldn't deliver there. I would have to go up to Fort Collins to deliver. If I happen to make it to induction date (3/17) then I am 5 weeks away as that would be 39 weeks for me. Gee, it is all happening so fast now. I have to admit, labor/delivery has always been my favorite part of the pregnancy but this time I am a little bit nervous. Since baby girl moved from the breach position and is now head down and possibly engaged, I shouldn't be as scared as I was a couple of weeks ago about the possibility of a C-Section. I guess my fear has gone from the threat of a possible C-Section to the worry that I will have a super fast birth with no time to think or get drugs if I want them. My neighbor told me a horrible story about one of her births. She ended up stepping out of her shower when she was preggo and immediately felt a contraction. Shortly after that, her baby girl delivered herself. She had no time to think or to call paramedics. How scary is that?! I would be traumatized without the support and care of a nursing staff overseeing everything during the birthing process. Nurses rock! Also, Clayton is a great labor coach so I would be lost if he wasn't around during the pushing phase. I have already gotten my hospital bag half-packed and all the stuff that I have for the IPs is already bagged and ready to go when the magic begins to happen. My pump and supplies have arrived so I am ready to move to the next phase. Whoo hoo! Now here is an extremely important question for you guys-What Nintendo DS game do I need to buy for entertainment? I have already finished MillionHeir, CrossworDS and Brain Age II. I need something new to occupy my down time in the hospital. Any recommendations? I gotta say, I am SUPER excited about our upcoming September family vacation. 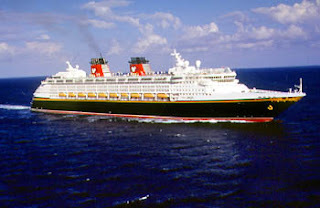 After researching alot on the net we finally found a fabulous deal on a Disney cruise. Everyone seems to think that Disney does it better than all the other cruise lines so we really wanted to try them. We found a great 7 day cruise in the western Caribbean and decided to book. The best thing is that our awesome friends, the Barnes', have decided to go too. We are going to have a blast! It's going to be a long wait beforehand. I am so impatient. That ticker is going to take forever to count down to departure. Ack. Hayden's actual birthday was on Thursday but we had a small party on Saturday with a few family members. He was so excited to see everyone and to have a day dedicated to himself. We ordered pizzas (I would normally cook something really good but I am supposed to stay off my feet as much as possible) and had a mint custard concrete cake with mini M&Ms from Culver's. We all relaxed and chatted while Hayden opened his gifts. His favorite gift was the marble toy that my IPs sent him. Grandpa Steve worked hard to get it all set up for him. That night we went to Red Robin for dinner and Hayden enjoyed being sang to by the wait staff. On Sunday, we headed up to Fort Collins so that Hayden could spend all of the birthday money he had accumulated. We took him to an awesome toy store but didn't find anything he really wanted. We took off to Target after that and he got himself a new game for his Nintendo DS (Diddy Kong Racing) and then we ventured over to Toys R Us where he bought Super Mario Galaxy for the Wii. He still has $25 to spend and I would be willing to bet that he will use it to buy another DS game soon. Last Thursday, we did several fun things since it was officially his big day. I took him to get hot cakes from McDonald's (at his request) and then I picked up some goodies for his class to eat. Emerson and I joined his class just after 3pm to celebrate with all the kiddies. We had M&M cookies, sour cream potato chips, Starburst candies and juice boxes. I really wanted to take cupcakes but the teachers request that you don't since kindergartners can be really messy. I can't say that I don't blame them for that, lol. For dinner, we ventured toward Denver to eat at a really random Mexican restaurant known as Casa Bonita. If you watch South Park on tv then you have likely seen an episode based on this weird place. There are guys who dive into a small pool of water in the middle of the place, a broken arcade, mediocre food, a guy dressed in a silly gorilla suit, Black Bart's Cave and lots of strange rooms for the kiddies to explore. The place is really odd. My friend Melissa brought her family to join us (her son Brayden was in Hayden's pre-k last year and they are good friends). Clayton took the kids to explore the place while Melissa, her hubby Rob and I sat and enjoyed some adult conversation for awhile. We all agree that this place stunk and isn't worth our time. At least the kids still managed to enjoy themselves.